I was excited to write this Flash Point: Fire Rescue review because it’s one of only a few co-op games that was designed for families. It also happens to be one of the only cooperative games with a firefighting theme! Is it a great game, though? Read on to find out! What is Flash Point: Fire Rescue? 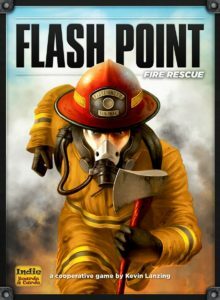 Flash Point: Fire Rescue is a co-op game in which you are a team of firefighters attempting to keep a house fire under control long enough to save the people (and pets) inside. You will take on one of the six firefighter roles and work with your teammates to move in and around the house as the fire spreads unpredictably. Flash Point was designed by Kevin Lanzing and published by Indie Boards & Cards. The Flash Point: Fire Rescue rules are quite simple, but beating the game can be pretty tough on the right difficulty level. As long as you understand how each action works, you can learn how to play Flash Point (especially the “family” version) very quickly. After you select your firefighter roles and have set up the board, you are ready to fight fires. During each player’s turn, he/she will be able to use four action points. These actions include moving, chopping walls, putting out fires, opening/closing doors, and carrying people/pets to safety. Players can also use their unique special abilities to get more done during their turns. After each player’s turn, they will roll dice to show where smoke will pop up around the house. Sometimes there is already a fire in or around these locations, causing the fire to spread. In the advanced game, there can also be hazardous materials added to the board, which can make the fires much more difficult to contain. The objective of the game is to find and save seven of the family members. If the fire causes too much destruction to the house or reaches four of the family members, then all of the players have lost. That’s just a quick overview of the rules to give you an idea of how the game works. You can download the official Flash Point: Fire Rescue rules (PDF) if you want to see exactly how the game plays out. Flash Point is a very thematic board game. You will feel like a firefighter every time you take an action, and the way the fire spreads works to build up tension. I personally realized just how thematic this game is when I first flipped over a person of interest token only to find out that it was a “false alarm.” I couldn’t help imagining being a firefighter in that situation and realizing all of that effort I had put in was for naught. Very cool. Other than the theme, the best thing about Flash Point is that it is extremely easy to learn and teach. The game comes with rules for a simplified version of the game, which makes it easy for even young children to learn. It was designed to be a family board game, and it is one of the very best cooperative games for families in existence. We also like that one person really can’t take over when playing this game. So much of the information on the board is hidden, so while you will want to talk to your teammates about what you want to do, it’s ultimately your decision where you go into the house. It encourages the right kind of cooperation. 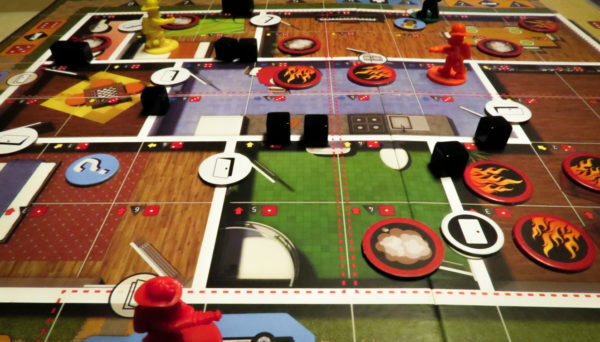 Sometimes dice rolling takes away from a game’s theme, but not in Flash Point: Fire Rescue. Fires seem to spread randomly when they get out of control and the dice simulate that very well here. Flash Point: Fire Rescue is also equally good at all player counts. Whether you are playing the game solo or with a five others, you can expect a solid firefighting experience. The game will last a bit longer at higher player counts, but even a six-player game can go by pretty quickly since turns don’t take too long. The reason why Flash Point isn’t very high up on our list of top cooperative board games is because it doesn’t offer great replay value. Well, at least not for the adults in our group who prefer meatier games. It just starts to feel a bit repetitive. It has plenty of replayability as a family game, though, and the Flash Point expansions add a lot to the base game. Flash Point: Fire Rescue is a very good firefighter board game that would be a great purchase for families or for anyone who likes the firefighting theme. It is a game that our group still brings to the table from time to time because of its strong theme and tense gameplay. Flash Point is currently number one in our family board game rankings! If you end up being a fan of the base game, we definitely recommend getting one or more of the many Flash Point expansions. Thanks for taking the time to read our Flash Point: Fire Rescue review!